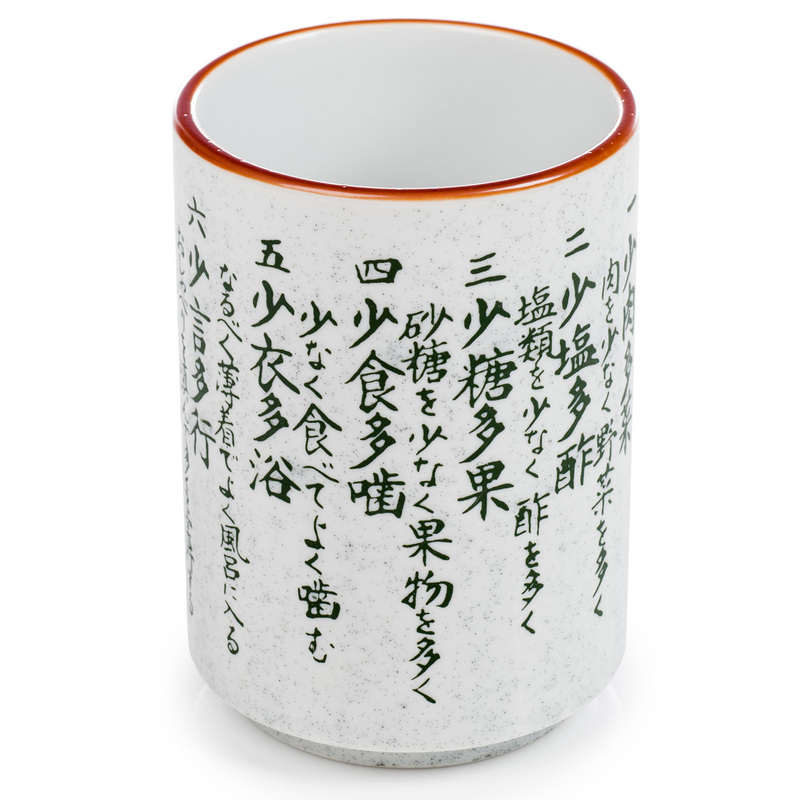 The Kenkou Good Health Japanese Tea Cup is a stylish light grey ceramic Japanese tea cup. It has a brown rim and details 10 guidelines for a healthy lifestyle, in Japanese kanji (see below)! Size: capacity 250ml, 7cm x 10cm / 2.75 x 4 inches, dishwasher and microwave safe. Traditional Japanese tea cup design, does not have a handle! Made in Japan an an ideal Japanese gift for keep fit and good health enthusiasts! 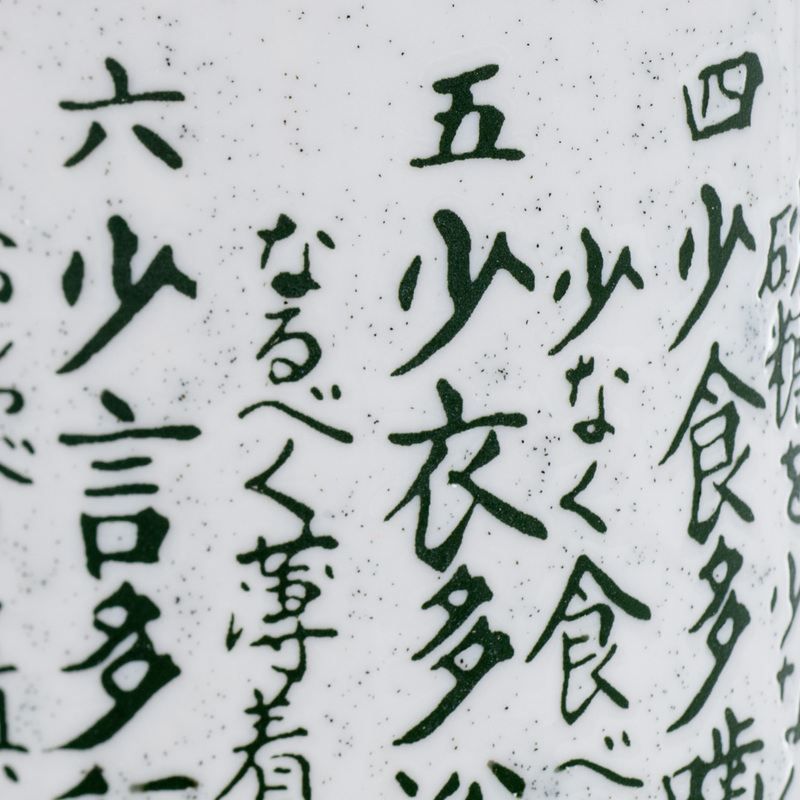 Perfect for healthy folk, the Kenkou Good Health Japanese Tea Cup is a stylish mottled white and light grey slender ceramic Japanese tea cup. It has a warm redy brown rim and details 10 guidelines for living a healthy lifestyle, in Japanese kanji script! As is the case with many traditional Japanese tea cups, the Kenkou Good Health Japanese Tea Cup does not have a handle! Made in Japan and complete with a smart gift box it would be an ideal Japanese gift for keep fit and good health enthusiasts! Suitable for use in a dishwasher or microwave. 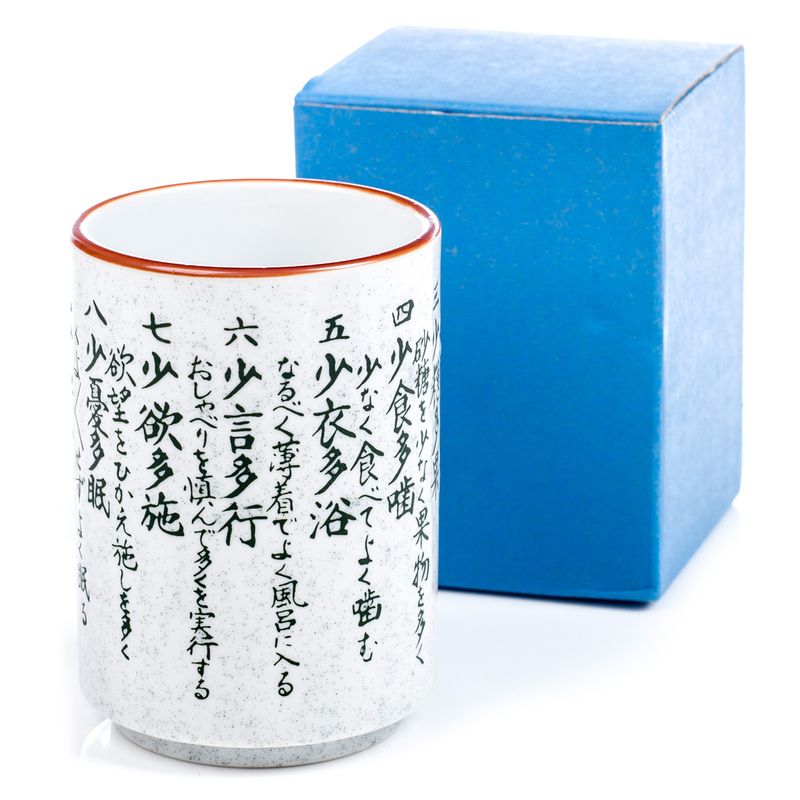 Order your Kenkou Good Health Japanese Tea Cups online and have them gift wrapped free of charge, or visit our showroom for this and many more authentic Japanese tea cups! Use more vinegar and less salt. Wear thin layers of clothes and take more baths. Wish for less and help others more. Worry less and sleep more. Be less angry and laugh more. Good evening Hiromi, I have just received my second order from you, the Kenkou Good Health Tea Cup. As with my first order, the canvas print of the Geisha, I am absolutely delighted with it...I am very pleased to continue doing business with your shop. Your products are indeed of high quality and I am very pleased to have found you. Thank you.